Goodbye to fall ball. Hello to winter ball. The Arizona Fall League season came to a close before Thanksgiving, but that only meant the ending of baseball in the United States. There's still plenty of cowhide being thrown around in Winter Leagues, specifically around the Caribbean in the Dominican Republic, Puerto Rico, Venezuela and Mexico. Those leagues may not get much attention stateside, but they are chances for affiliated players, specifically prospects, to build on their 2018 seasons and prepare for 2019, either by making up for lost time or just gaining valuable additional experience. Besides, where else can Padres fans get their Fernando Tatis Jr. fixes in November? With all four Caribbean leagues under way, these are some of the ranked prospects playing with something to prove this winter. 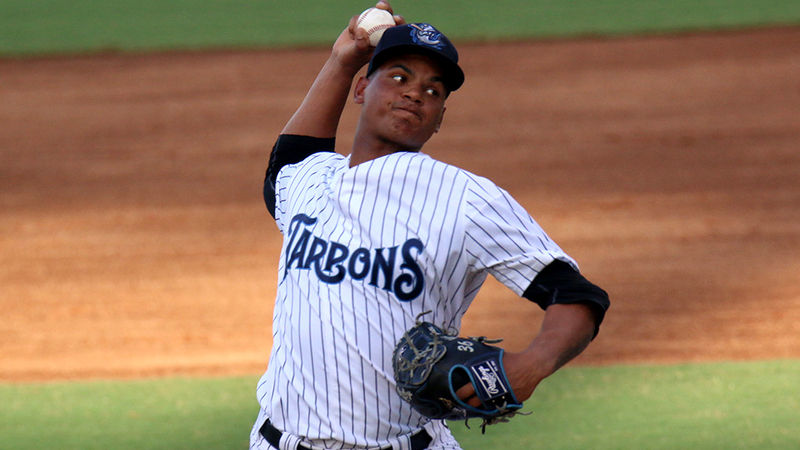 Yankees RHP Albert Abreu, Tigres del Licey (Dominican Republic): The Yankees' No. 3 prospect was added to the 40-man roster as Rule 5 Draft protection last November and suffered through somewhat of a lost year due to an appendectomy and right elbow inflammation -- injuries that limited him to 72 2/3 innings. He cracked Double-A Trenton for one start in September (not allowing a hit over five innings) before moving to instructs and his native Dominican Republic. When healthy, the 23-year-old right-hander has high-octane stuff, headlined by an upper-90s fastball that can touch triple digits. It's already playing to good effect with Licey as he's posted a 1.50 ERA and a 1.17 WHIP through 18 innings, though control (eight walks) is an early concern. This is foremost a chance for Abreu to make up innings, but if his stuff holds up in the coming weeks, that might be a signal the Yankees could push him aggressively as they did with fellow 40-man member Jonathan Loaisiga this past summer. A's SS Jorge Mateo, Toros del Este (Dominican Republic): Once a Top-100 prospect and considered a big piece in the Sonny Gray trade, Mateo's stock took a big drop in 2018 after he hit just .230/.280/.353 with a 27.3 percent strikeout rate in 131 games at Triple-A Nashville. His 62 wRC+ was tied for 64th out of the 66 qualified batters in the Pacific Coast League. Basically, wherever Mateo played next, he was going to have answer questions about his bat. That turned out to be the Dominican Republic with Este. Early results proved lacking for the 23-year-old shortstop. He's gone 9-for-50 (.180) with two doubles in 18 games. But the good news is he has an even 10/10 K/BB ratio and a .328 OBP, allowing him to take advantage of the 80-grade speed that still will get Mateo into the Majors at some point. Showing more with the bat starting now will help his case to be more than a future pinch-runner extraordinaire. Giants OF Heliot Ramos, Cangrejeros de Santurce (Puerto Rico): Ramos only just turned 19 in September and is only 18 months removed from being selected as the 19th overall pick in the 2017 Draft. Long-term, this trip back home with Santurce is far from a make-or-break situation for the Puerto Rico native. That said, the right-handed slugger could use a bit of a pick-me-up after producing a .245/.313/.396 line with 11 homers in 124 games at Class A Augusta this season. That was still a solid 104 wRC+, but wasn't quite up to par to the standard Ramos set with his incredible Arizona League campaign in 2017. Playing a first full season stateside and the attempt to tackle more than 120 games in a single stretch might have caused the dip, but a return to home and to form would be a welcome development for a Giants system going through a bit of a down spell. Cardinals SS Delvin Perez, Gigantes de Carolina (Puerto Rico): Another first-rounder from the commonwealth of Puerto Rico has a lot more to prove than his San Francisco counterpart. Perez was largely seen as one of the top talents in the 2016 Draft, but slipped to St. Louis at No. 23 overall after testing positive for a PED. He still hasn't cracked a full-season roster over three seasons in the Minors and is coming off another struggling campaign in which he batted .213/.301/.272 with only nine extra-base hits and a 76 wRC+ in 64 games at Class A Short Season State College. The 20-year-old shortstop has plus speed and is seen as a good defender at a demanding position, but his offensive profile already caused him to drop to the No. 28 spot in MLB.com's Cardinals rankings. It's very possible he will drop out of the top 30 altogether when the 2019 update is released. Perhaps the familiarity of home could help put him back on solid footing. Rangers LHP Yohander Mendez, Navegantes de Magallanes (Venezuela): Mendez made his Major League debut on Sept. 5, 2016. Two years later, he's still considered a prospect following a rough 2018. At one point, the Rangers' No. 16 prospect was sent from the Majors all the way down to Class A Advanced Down East following an off-the-field incident in Kansas City in June. When he was on the mound, his results weren't that great in the Minors (4.71 ERA, .272 average-against in 122 1/3 innings) or the Majors (5.53 ERA, 15 walks over 27 2/3 frames). Back in his native Venezuela, the 23-year-old left-hander has one more shot to show he can stick as a starter or else he might move to the bullpen for good in 2019. So far so good. Mendez has allowed only one earned run in each of his three starts with Magallanes, posting a 1.80 ERA with seven strikeouts and three walks over 15 innings. Braves LHP Ricardo Sanchez, Navegantes de Magallanes (Venezuela): This one's pretty clear. The Braves designated their No. 26 prospect for assignment Monday after announcing the free-agent signing of Brian McCann. As of this writing, it's too early to determine whether Sanchez will clear waivers or he'll stick with Atlanta off its 40-man roster, but he'll either be pitching in Venezuela to make a solid first impression with any claiming club or to regain his status in the Braves' pipeline. The 21-year-old southpaw, who gets above-average grades for his fastball and curveball, missed about three months over the summer with shoulder tightness and managed just a 4.06 ERA and a 1.54 WHIP with 44 strikeouts in 57 2/3 innings with Double-A Mississippi when healthy. He's already made seven starts for Magallanes with solid results (3.45 ERA, 22 K's in 31 1/3 innings), and he'll keep adding innings -- and potentially adding to his reputation -- back home. Cardinals INF Ramon Urias, Caneros de Los Mochis (Mexico): The Cardinals' No. 20 prospect might be returning south of the border as the epitome of the Mexican League dream. Urias played in the Mexican League -- both in summer and winter -- from 2013 to 2017 before signing with St. Louis last offseason. He performed well at both stops he made in his new system, hitting .300/.356/.516 with 13 homers and 28 doubles in 90 games split almost evenly between Double-A Springfield and Triple-A Memphis. The Cards liked enough of what they saw to add the 24-year-old utility infielder to the 40-man roster as Rule 5 protection, and now he's back with Los Mochis as a potential Major Leaguer. It's still the same dominant Urias, however. He leads the Mexican Winter League with a .344 average in 38 games and ranks third with a .954 OPS. Urias just had to make the Cardinals look smart for protecting him. He's doing that and a whole lot more back in Mexico. Cardinals OF Randy Arozarena, Mayos de Navojoa (Mexico): Same Major League club. Different Mexican Winter League team. Ranked as St. Louis' No. 6 prospect, Arozarena started the season at Triple-A Memphis, but got squeezed out of that outfield due to the organization's upper-level depth on the grass. When he was at Triple-A, the 23-year-old didn't quite show the solid bat of 2017, batting .232/.328/.348 with five homers and an 81 wRC+ over 89 games with Memphis. He's back in Mexico, where he played summer and winter ball in 2016-17, and he'll need to show a little better bat, perhaps starting with getting the ball in the air more after posting a 53.5 percent ground-ball rate in the Pacific Coast League.